Monday: Hungarian mushroom soup Vegetable grilled cheese Greek salad Tuesday: Chili Taco in a bag Taco salad Wednesday: Meatball and tortellini soup Chicken and waffle sandwich Crispy chicken and bacon salad Thursday: Potato soup Steak sandwich Steak and tomato salad Friday: Fall vegetable soup Hot ham and cheese sandwich Chef salad It's egg nog season! Come enjoy and delicious egg nog latte! This entry was posted in Uncategorized on October 26, 2015 by Jodi Mackay. Do you need new flooring? Have you been dreaming of new flooring for your home? 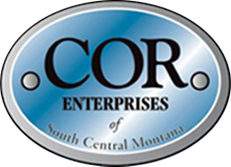 Do you want to support COR Enterprises? Well, Pierce Flooring and COR has the answer! COR employees, and others affiliated with COR, are eligible to receive gifts with purchases at Pierce Flooring. 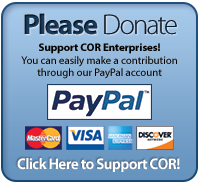 COR will also receive a 2% donation on the purchases. Sounds like a win-win! The reward cards and more info is available at COR's front desk. This entry was posted in Uncategorized on October 22, 2015 by Jodi Mackay. This entry was posted in Uncategorized on October 19, 2015 by Jodi Mackay. This entry was posted in Uncategorized on October 5, 2015 by Jodi Mackay.